When it comes to identifying killer trick Praxis World and US History questions, you’re more than confident that your study guides and practice tests prepared you. You know not to fall for Praxis History answer options that use totalizing words (like “all”, “none” and “everyone”). You know that answer options that look far too specific are usually designed to throw you off. Above all, you know not to panic whenever you see a pattern in your answer selected response answers, for example, a lot of a.) or c.). Sounds like when it comes to your Praxis World and History test prep, you’ve got all of your bases covered – right? 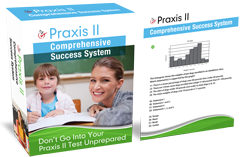 …Your Praxis study guide book and practice exams have barely scratched the surface of the iceberg. …But when it comes to rounding up the biggest culprits of the bunch, you need the best of the best. Luckily, we got an opportunity to take a sneak peek inside these golden Praxis World and US History study guides. You can imagine this is a problem on several other ETS exams like Praxis School Psychology, Elementary Education, Math and Social Studies. And what we discovered might just transform the way you approach your Praxis History test preparation for good! The ETS always inserts an answer choice that is true – but doesn’t apply to the passage itself. These are designed to trip up speedy test takers, as their first instinct will be to select this test trap. Praxis World and US History test takers know that the best answer choice should succinctly answer the main question of the passage. But be careful of answers that go beyond the main points of the passage. Always stay firmly within the borders of the passage or question, and never fall for an answer that presents more information than what’s given. Don’t select an answer that simply sounds familiar to the information presented in the question. While all of the answers will be similar to the question, read each one carefully to determine just what the question is asking for. No skimming! …And if you want the best Praxis World and US History practice test and preparation book possible, then you need to fight back with the best test prep tools.